Adobe Flex Builder, an Integrated Development Environment (IDE) for Flex application uses system default Web browser to running and debugging applications. 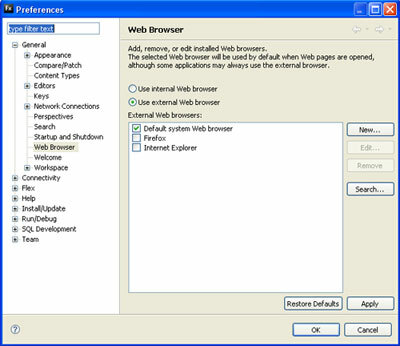 To change the default Web browser to another Web browser, you can change the workbench Web browser setting which effects how application are run and debugged. Open your Flex application project and run, your application should be run in the specified Web browser.